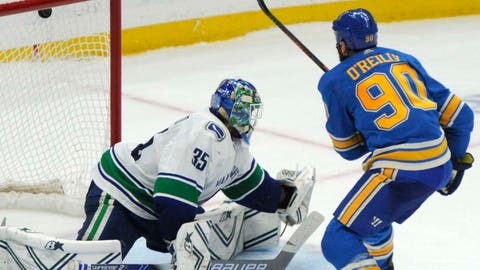 Ryan O'Reilly scored one of the Blues' two shootout goals as they defeated the Canucks on Saturday afternoon. Binnington stopped both shots he faced in the shootout, and the St. Louis Blues remained in the hunt for the Central Division title with a 3-2 win over the Vancouver Canucks on Saturday. Later in the evening, wins by the Predators and Jets left the Blues where they started the day, in third place. Binnington finished with 23 saves and closed out his breakthrough campaign with a 24-5-1 record. St. Louis interim coach Craig Berube said the rise from the cellar to the playoffs in just three months took a total team effort. Blues: Return to postseason after missing out last year. The Jets will have home-ice advantage in the first-round series.